The Chief Executive Officer of the Russian Investment Agency Yury Voicehovsky takes part in the XIII International Investment Forum “Sochi”. The event was opened by the Prime Minister of the Russian Federation Dmitry Medvedev, who in his speech outlined the position on the most pressing issues. According to Medvedev, Russia should focus on the development of the Far East and Siberia, which have great potential. The Prime Minister said that the first14 sites had been already selected for the program of priority development areas. He noted that the share of trade between Russia and the countries of Asia will continue to grow, as this region is the fastest growing region on the planet. Dmitry Medvedev is sure that the place of Western goods, which fell under Russian embargo, will be very quickly occupied primarily by domestic products and suppliers from other countries. The Prime Minister believes that the West has forgotten that Russia has its own national interests, and has unleashed the “sanctions” war and is trying to isolate half of Eurasia from the rest of the world. Having said that, Dmitry Medvedev stressed that Russia is ready to continue cooperation with Western partners and the turn to the East is not the revenge to Europe. Russia will cooperate not only with the large Asian countries like Japan, India and China, but also with smaller states in the region, said the head of the Russian government. At the event the global economic trends as well as the prospects for investment and innovation future of Russia will be discussed. Traditionally at the Forum the regional delegations present a significant number of investment projects. 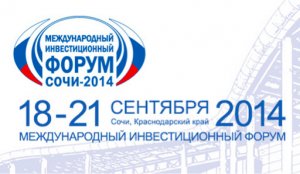 Yury Voicehovsky is one of the main speakers at the central event of the Sochi forum scheduled for 19th of September – the panel discussion on opportunities for international cooperation in the time of exchange of sanctions.